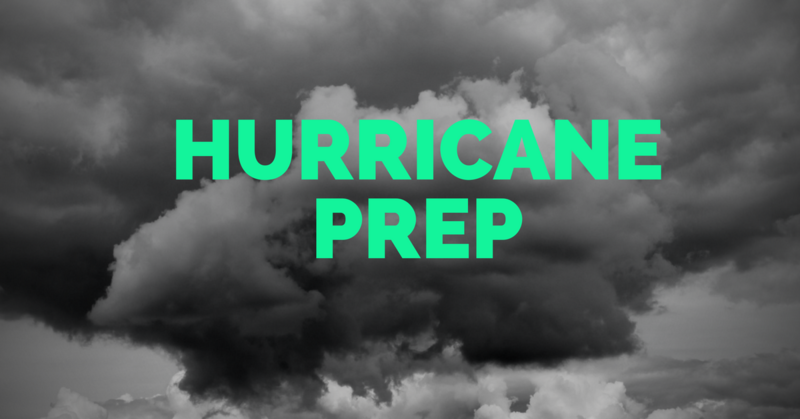 9 Hurricane Prep Musts | 1st Residential Funding Inc. The American Red Cross suggests you have water supplies for at least three days. This means you have one gallon per day for each member of your household. Next, the National Hurricane Center recommends a flashlight and basic first aid kit. Along with the flashlight, of course, should be plenty of batteries to make each flashlight work properly for a couple of weeks. The Modern Survival Guide suggests everyone have a two-week supply of medication. The State of Florida, in their Essential Guide to Hurricane Preparedness, says to have important documents located in a waterproof container near your hurricane kit. Your pet should be a part of your family plan. If you must evacuate, the most important thing you can do to protect your pets is to evacuate them. Ask friends, relatives and others outside of the affected area whether they could shelter your animals. If you do not need to evacuate, WESH 2 in Orlando recommends essential pet food and medication be packed in a hurricane survival kit. You may need gas to run generators or more importantly to evacuate. Also ATMs may be down and those of us use to paying with debit or credit may not have that availability with power outages so gas up and cash out! Personally, as a Florida native and living through so many hurricanes, I recommend plenty of baby wipes and bug spray to be packed in your kit! And last but not least, we recommend chargers for cellphones. While you might be out of power for a while, you could still be connected to cell service. So, purchase an extra charger or two that do not require plugs. We hope this list is easy enough and simple enough to start a Hurricane Prep Kit today, rather than waiting until you hear an announcement on the radio! Lynda, this is a great list! I might actually follow it!